New York (TADIAS) – The Taitu Cultural & Educational Center, which serves as a platform for Ethiopian theatrical productions in the U.S., marks its 14th anniversary this year. 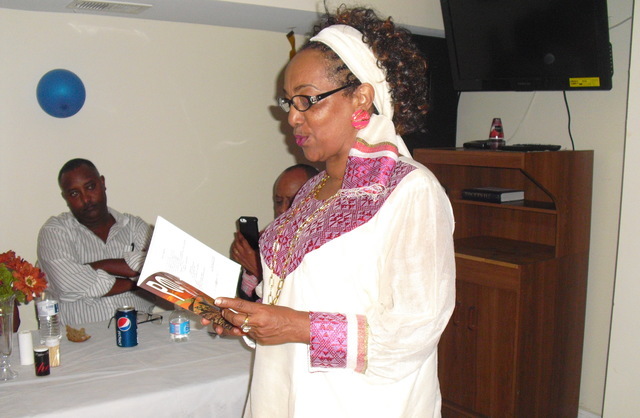 The DC-based organization was founded in 2000 by Ethiopian-born actress, playwright and poet Alemtsehay Wedajo, and has staged over 30 plays and concerts since it was launched. That’s in addition to hosting book releases, guest authors, comedians and a popular monthly poetry night called YeWeru Gitm Mishit showcasing emerging and veteran talents in literature as well as painting, film-making and music. The 14th anniversary celebration is scheduled for Sunday, November 2nd at Tifereth Israel Congregation in Washington, D.C. The event’s program features a play called Yasteyikal. A comedy and selected poems of the year will also be recited by legendary performers including Alemtsehay Wedajo and Tesfaye Sima. Theater productions and stage activities organized by the Taitu Cultural Center in the last decade have become a magnet for established and aspiring Ethiopian artists and authors residing in Washington, D.C.